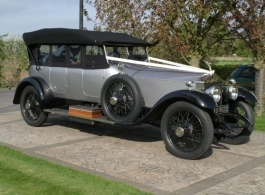 This vintage Rolls Royce wedding car is fitted with hood and side screens for full weather protection and has a rear auster screen to minimise wind disturbance. This Rolls Royce Silver Ghost Alpine Eagle has been totally rebuilt to its original specification. It has won three major trophies at the Rolls Royce Enthusiasts Club International Rally and was awarded the trophy BEST CAR IN SHOW by Rolls Royce Motors. The price you see is for a single car although there are 2 of these available.